From Walking Melbourne, The National Trust Guide to The Historic and Architectural Landmarks of Central Melbourne. This is a stylish example of the massive grandeur of the first phase of Classical revival as practiced in America, known as the Beaux-Arts. 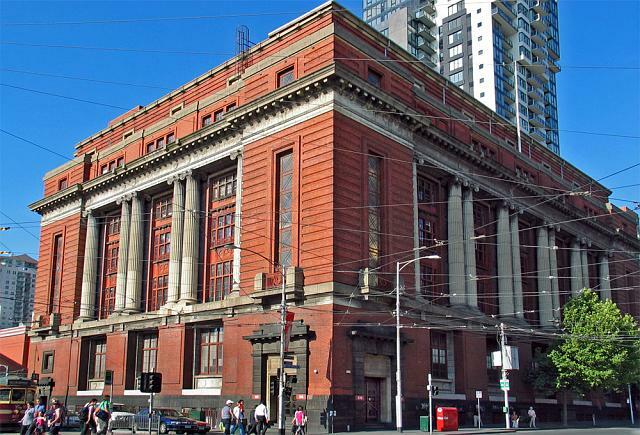 Completed in 1917, it is one of the earliest such examples in Melbourne, and was designed by the first Commonwealth Government Architect, John Smith Murdoch. 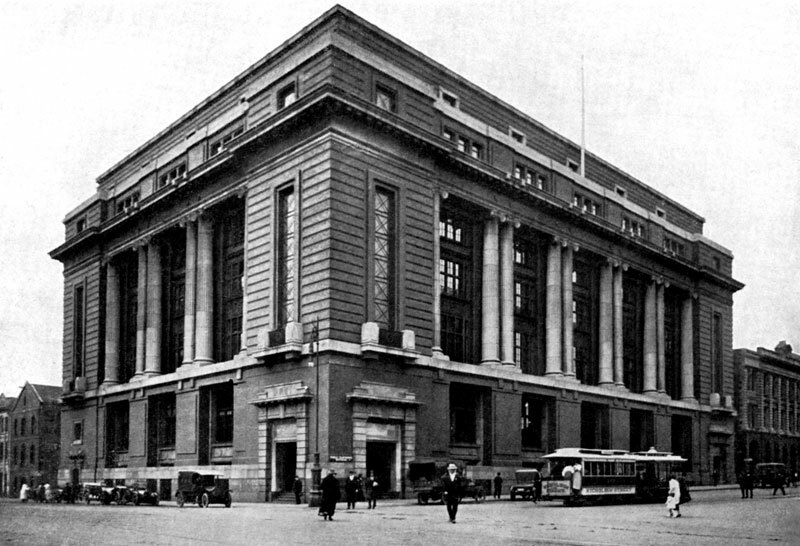 The reception and distribution of mail was made more efficient by its location near Spencer Street Station, to which it is connected via a tunnel. An old photograph from the 1920s. One of my own below. How it currently looks after a recent renovation. Prior to the erection of the former Mail Exchange, its site was where Robert Hoddle acquired land from the Crown and constructed a two storey Georgian home and gardens and lived in, until his death in 1881. Robert Hoddle was the first Surveyor General of Victoria and is credited with the physical layout of the streets of the city of Melbourne, these days referred to as “the Hoddle Grid”. The Former Mail Exchange was also the GPO for a time as well. Yuck... those yellow pillars look terrible. They clash with the red and looked much better white. Why were they re-painted? Located on the corner of Bourke and Spencer Streets, The Mail Exchange Hotel is Melbourne's newest pub. Housed on the lower ground floor of the former Mail Exchange Building, which was built in 1917, the Mail Exchange Hotel has been meticulously restored and features a 200 seat bistro, stunning central bar, atrium with internal courtyard, informal lounge areas, TAB kiosk and free WiFi. ^^ I believe it houses both the Whitehouse Institute of Design and the Mail Exchange Hotel. You're right. Sorry, wasn't trying to suggest you were wrong.